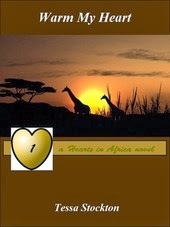 The first book of the HEARTS IN AFRICA series, "Warm My Heart," by Tessa Stockton, is an inspirational romance about two people who find a unique bond while on a missionary trip in Africa. The main characters, Sarah and Mitch, are both in Africa following events in their past that they want to put behind them. Through the trials of their environment, they learn about themselves and each other, growing as individuals. The plot of this book is very much character-driven, and the reader is determined to find out what happens to Sarah and Mitch next. The writing is fitting for the genre (inspirational romance), and Stockton has the characters reflecting about decisions, which leads to the characters' personal growth. There are a lot of fun scenes, involving adventure and humor, that keep the feel of the book light-hearted throughout. Overall, this is a great book for anyone looking for an uplifting, inspirational romance about love and faith.